Physical pre-orders go live on February 13th at Super Rare Games. Toxic Games’ physics-based puzzle title Q.U.B.E 2 is officially heading to Nintendo Switch on February 21st 2019. The first-person puzzler will launch on the Switch eShop with a 15% discount and as a limited physical print courtesy of Super Rare Games. Q.U.B.E 2 is a mind-bending first-person puzzle game where players take on the role of stranded archaeologist Amelia Cross. After waking up in an alien land shrouded by an aggressive sandstorm, Amelia soon finds herself trapped deep within a maze-like monolith. With only some mysterious gloves, a bad case of amnesia, and the distant radio transmissions of another survivor to aid her, players must help Amelia uncover her past and find a way off the planet. Often likened to games like Portal 1 / 2 and The Talos Principle, Q.U.B.E 2 features 11 diverse environments to explore and over 80 physics-based puzzles for players to solve. The core game-play focuses around the use of Amelia’s manipulation gloves, which allow the player to interact and adjust the architectural structure surrounding them to proceed through the game. 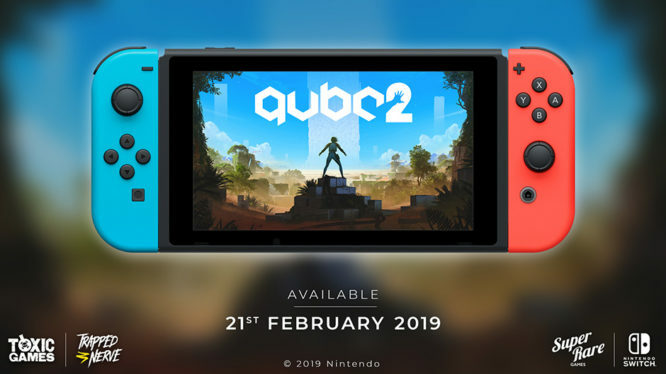 Although Q.U.B.E 2 is set to release for Nintendo Switch on February 21st, physical enthusiasts will be able to pre-order a limited physical version as early as February 13th. Toxic Games partnership with Super Rare Games will bring 4,000 physical copies of Q.U.B.E 2 to market, which will be sold exclusively on SuperRareGames.com for £29.99. In addition to a copy of the game on cart, the SRG release will also include an exclusive themed sticker, full-colour manual, and a pack of collectable trading cards. Q.U.B.E 2 will hit Nintendo Switch on February 21st 2019 and will available digitally for £22.99 / €25.99 / $29.99. During the game’s initial launch period, players will also be eligible for a 15% discount on the Nintendo eShop. Pre-orders for the physical release will open on February 13th, priced at £29.99, and are limited to 4,000 copies. If you can’t wait to get your manipulation gloves on Q.U.B.E 2, then you can check out the official Nintendo Switch announcement trailer below.